Tightening Straps Before Parachuting - Stock Footage, Inc. 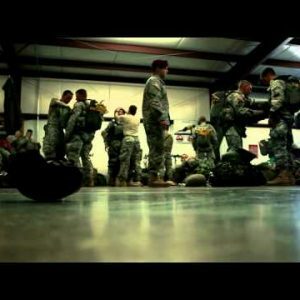 Tags: airplane, airport, anticipation, armory, army, bag, bags, beret, berets, camo, camoflauge, camouflage, force, forces, gear, green, guard, hangar, hanger, helicopter, helmet, male, Man, men, military, national, operations, pack, parachute, paratrooper, preparation, prepare, preparing, pull, pulling, reserves, safety, soldier, soldiers, special, strap, straps, suit, tan, team, tightening, training, two, uniform, war. One man tightens straps of gear bags on another man preparing to parachute. 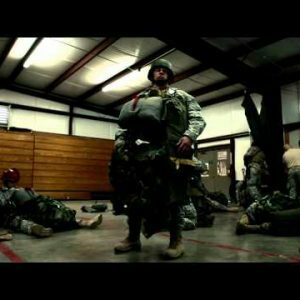 They are in a preparation building at training for Green Beret United States Army Special Forces.